Our services are completely client centered. As an Investment Advisor Representative, we are held to a fiduciary standard to do what's in the best interest of our clients. 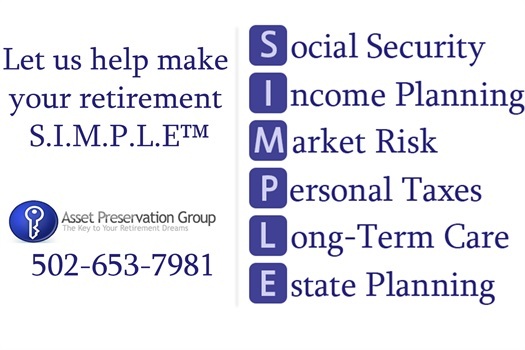 With our S.I.M.P.L.E.™ process, we help you develop strategies to help you maximize your retirement goals, and keep your retirement simple. To develop a financial strategy for your future, it's important for your financial professional to see a complete, 360-degree view of your financial pictures, including how your retirement assets are integrated and work with one another. Our financial strategies and asset management services use insurance products, such as annuities, to help you meet financial goals. We work with tax professionals and attorneys to advise you on specific aspects of your financial strategy. Diversifying your retirement assets among a variety of vehicles -- both through insurance products and investments, depending on what is appropriate for your situation -- may offer you the best chance of meeting your retirement income goals throughout your lifespan. Today, the majority of the burden for retirement income seems to have shifted to the individual. For this reason, you may want to consider a guaranteed* fixed income component to your retirement strategy. In short, adding an annuity may be an opportunity to help ensure a portion of your retirement income will be guaranteed. * An annuity is a contract you purchase from an insurance company. For the premium you pay, you receive certain fixed and/or variable interest crediting options able to compound tax deferred until withdrawn. When you are ready to receive income distributions, this vehicle offers a variety of guaranteed* payout options. Most annuities have provisions that allow you to withdraw a percentage of the value of the contract each year up to a certain limit. However, withdrawals will reduce the contract value and the value of any protected benefits. Excess withdrawals above the restricted limit typically incur "surrender charges" within the first five to 15 years of the contract. Because they are designed as a long-term retirement income vehicle, annuity withdrawals made before age 59 1/2 are subject to income taxes. * Annuity guarantees rely on the financial strength and claims-paying ability of the issuing insurance company. Annuities and insurance products that may be subject to fees, surrender charges are holding periods which vary by carrier. Annuities are not FDIC insured. Life insurance isn't for those who have died -- it's for those who are left behind. When shopping for life insurance, consider needs such as replacing income so your family can maintain its standard of living, as well as paying for your funeral and estate costs. A general rule is that you may want to seek coverage between five and seven times your gross annual income. As far as the various types of policies go, they can generally be placed into one of two categories: term and permanent. Rising taxes may be concern for many individuals approaching retirement. It may be important to incorporate tax planning into your financial decisions. Investing in or purchasing a tax-deferred vehicle means your money can compound interest for years, free from income taxes, potentially allowing it to earn interest at a faster rate. Few financial vehicles avoid taxes altogether. Insurance products only allow you to defer paying them until retirement -- when you may be in a lower tax bracket. Please note that withdrawals will reduce the contract value and the value of any protection benefits. Additional withdrawals taken within the contract withdrawal charge schedule will be subject to a withdrawal charge. All withdrawals are subject to ordinary income tax and, if taken prior to age 59 1/2, may be subject to a 10 percent additional federal tax. We work with tax professionals and attorneys to advise you on specific aspects of your financial strategy. With changes in the tax environment, there may be compelling reasons to integrate philanthropy into your financial and estate planning. We can refer you to a qualified professional to help you decide if this is a good option for you.